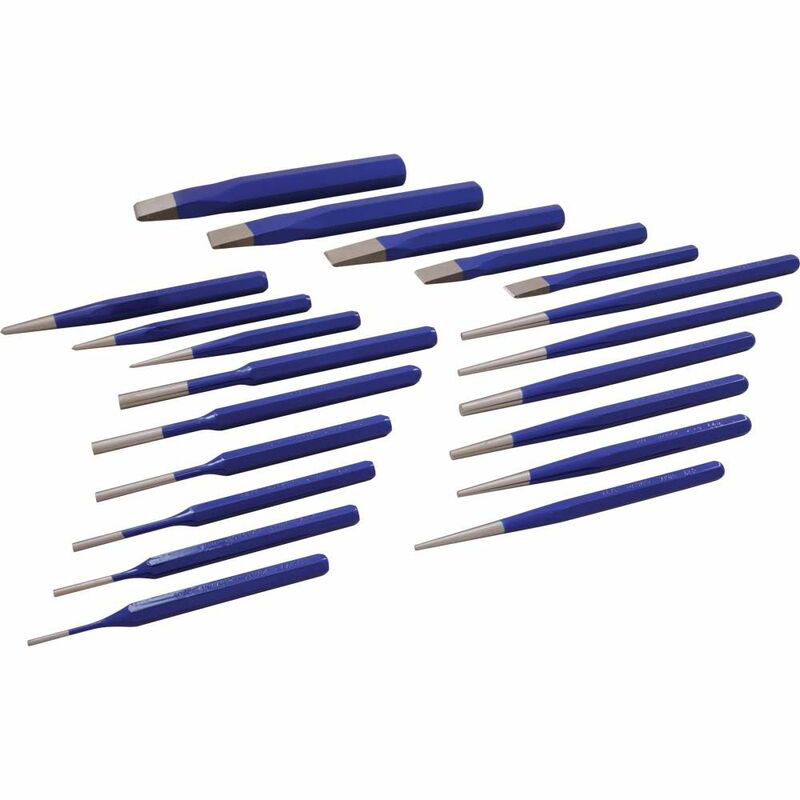 The punches and chisels in this 20 piece set are specially heat-treated to provide a hard working end and softer striking end to avoid chipping. All Gray punches and chisels are made from the highest quality materials for maximum tool life. Made in Canada and backed by Gray Tools worry-free lifetime warranty. Contains: Flat Chisel 1/2", 5/8", 3/4", 7/8", 1", Long Taper Punches 5/32", 3/16", Taper Punches 3/32", 1/8", 3/16", 1/4", Pin Punches 1/8", 5/32", 3/32", 3/16", 1/4", 5/16", Prick Punch 3/8" and Centre Punches 3/8", 1/2". The screw extractors in this 10 piece set feature straight, tapered flutes that provide a secure and firm grip. Made in Canada and backed by Gray Tools worry-free lifetime warranty. The two magnetic pick up tools included in this set provide the extra reach needed to pickup up small parts and objects not accessible by hand. The telescoping tool extends up to 26-1/2" and can lift objects up to 2lbs. The included clip on the 6" tool makes it ideal tool for carrying in any shirt pocket. Easily retrieve reach small metal objects. The mechanical fingers & telescopic magnetic pick up tool included in this 2 piece set provide the extra reach and precise grip need to pickup up small parts and objects not easily accessible by hand. Easily reach around obstacles to retrieve dropped parts. The screw extractors in this 5 piece set feature an aggressive spiral design that removes even stubborn broken bolts. Made in USA and backed by Gray Tools worry-free lifetime warranty. 20 Piece Punch And Chisel Set The punches and chisels in this 20 piece set are specially heat-treated to provide a hard working end and softer striking end to avoid chipping. All Gray punches and chisels are made from the highest quality materials for maximum tool life. Made in Canada and backed by Gray Tools worry-free lifetime warranty.